Howard: We were lucky enough to grab a couple of seats at the desks where there is table service, because the place filled up very quickly. I was happy to see a “Veggie Bahn Mi” [sic] on the menu, so of course that’s what I ordered. The filling was a thick paste made with grains and nuts as well as copious amounts of black pepper. The paste oozed out of the sandwich as I bit into it, necessitating a knife and fork. 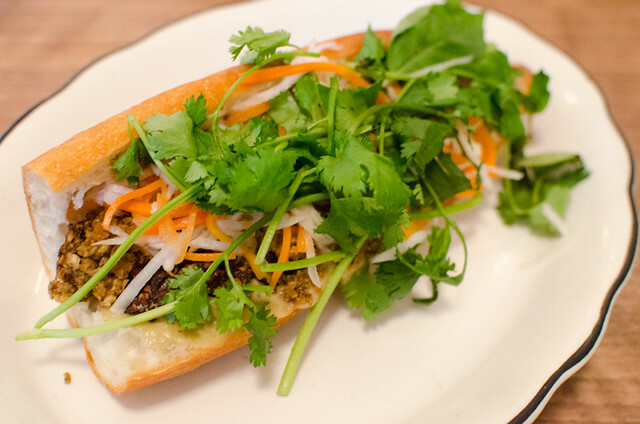 A knife and fork to eat a sandwich seems a little silly, but so does spending $10 on a banh mi. The sandwich was very good, though, so maybe it was worth it. Donny: I had seen so many photos of the egg in jelly topped with uni from their preview party, I was HOPING that they would serve it for lunch. Sadly it wasn’t on the menu but on a rainy day (it was raining that day) a clam chowder sounded pretty perfect. Spoiled by the crazy dishes when M. Wells was still a diner, I was hoping to find things like duck nuts in the clam chowder. But in the end, this was a pretty normal cup of soup, a delicious one though. It was filled with tiny chewy clams, potatoes, carrots and pearl onions. Surprisingly, it was pretty light. I also got the cod brandade. 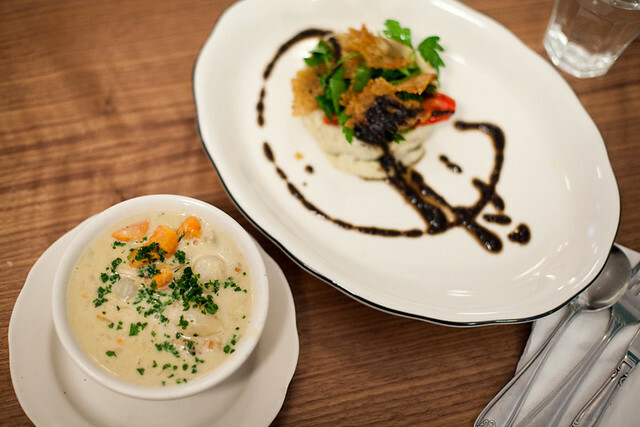 I had no idea what a brandade so I was surprised to find the mushy white stuff on the plate to NOT be mashed potatoes but…..tasty cod. 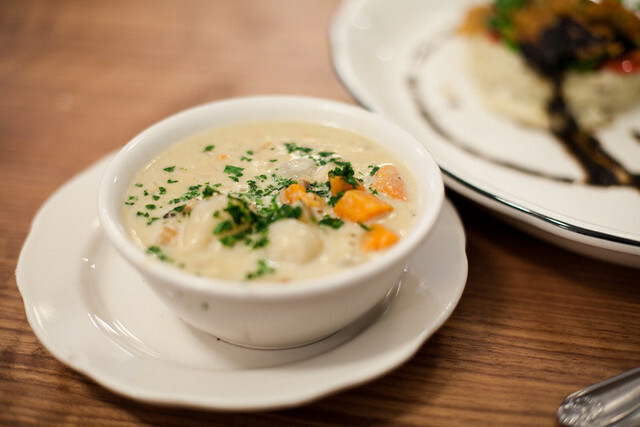 This was light and tasted fresh with the addition of parsley and actually went pretty well with the chowder. Nothing on the menu was over $10 and that’s pretty damn good. 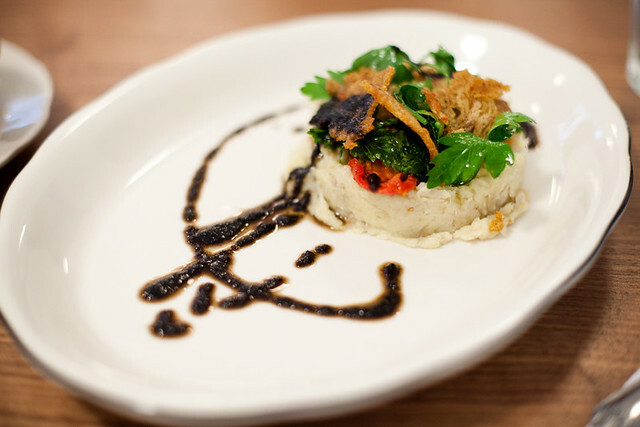 Unlike the old M. Wells with a set menu, the dinette seems to be on a daily rotating menu. Hopefully next time I’ll get to eat the egg in jelly.